July has offered us opportunities to strengthen our public-private partnerships, ramp up our awareness campaigns, and provide even more children with high-quality helmets. The new school year will be upon us soon enough, and our staff is hard at work preparing to launch another round of school-based programs that will build on the lessons learned and many successes of the last year. Read on for more information about the tremendous work our team has done this month to reduce traffic casualties around the world. AIP Foundation's Vietnam National Program Manager Nguyen Dieu Nuong and Cambodia Country Director Kim Pagna were selected to attend the Road Safety Scholarship Programme from July 1-13 in London, UK, sponsored by the Fédération Internationale de l'Automobile (FIA) Foundation. Every year roughly 13 scholars from around the world participate. The programme blends theoretical and practical knowledge with sessions in London and a field trip to Kent, where there is highly successful road safety partnership. 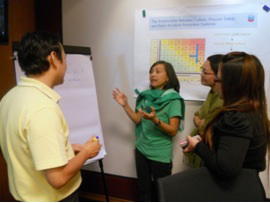 Attendees were also tasked with a group project to devise a national road safety strategy for an invented country. 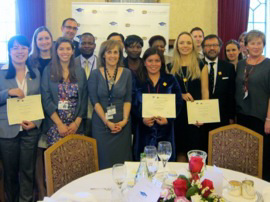 The closing luncheon and ceremony took place in the House of Lords and was attended by HRH Prince Michael of Kent. Our delegates have developed an action plan for applying the knowledge learned to operations in Vietnam, Cambodia, and beyond. Motorbike sales fall – Honda, Piaggio, Yamaha, and other Vietnam-based motorbike manufacturers are reporting high inventories and increasingly low sales. 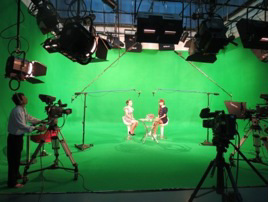 HTV filmed an episode of the talk show "Woman and life", featuring Vietnam top model and Goodwill Ambassador Vu Ha Anh. The program explored Ha Anh's life and her responsibility to improve public awareness about traffic safety and specifically child helmet use. When asked why traffic safety matters to her, Ha Anh shared that in her position as Goodwill Ambassador for United Nations Children's Fund and AIP Foundation, she "was really shocked to learn that every year in Vietnam nearly 2,000 children die as a result of traffic accidents. What families do not realize is that they can avoid the tragedy of losing their beloved children if they put helmets on them. Helmets do not harm children's spines as some adults misunderstand. In fact, helmet use can reduce the risk of head injury by 69%." Ha Anh advised parents to, "always put helmets on your children before starting your bike's engine. Remember, accidents always happen when you least expect it, so be prepared for your children's safety." Click here to view the interview online. AIP Foundation conducted an information session for a delegation of eighteen Johnson & Johnson leaders from across the globe. The group consisted of senior management from divisions throughout Johnson & Johnson, including Consumer Health Care, Medical Devices & Diagnostics, Pharmaceuticals and Supply Chain Management. Their trip to Vietnam is part of Johnson & Johnson's Accelerate Enterprise Leadership program, which aims to help the company's leadership learn about external perspectives on the market. The information session covered AIP Foundation's current programs and the Global Helmet Vaccine Initiative. 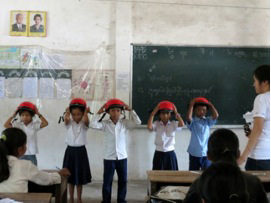 Johnson & Johnson committed 140,000 USD to AIP Foundation earlier this year to implement Helmets for Kids. Through their sponsorship, a total of 11,000 helmets are being donated to 17 schools in central Vietnam and 3 schools in Dong Nai. AIP Foundation facilitated an information session for thirty employees of Chevron Vietnam Ltd. in Ho Chi Minh City and Hanoi. The session covered Chevron's support of AIP Foundation, information on helmet use in Vietnam, and a discussion about the reasons parents have for putting a helmet on their child or not. AIP Foundation program staff also explained the steps for wearing a helmet correctly and provided a list of high-quality helmet manufacturers. In surveys, participants remarked that our campaign videos were awakening and the material covered was very useful and relevant to them. Beginning this month, AIP Foundation's public awareness campaign "Children also need a helmet" is employing various online channels to target parents, who bear the responsibility of their child's safety. Through blogs, a Facebook fan page, and discussion forums, the campaign facilitates discussion among parents in Vietnam and promotes helmet-use as a parent's duty. The social media activities will run from July to September 2012. Click here to visit our forums on Lamchame and Diendan to participate in this campaign. Handicap International celebrates 30 years – Handicap International, founded in response to the needs of Cambodian refugees in 1982 and one of our most important partners in Cambodia, celebrates 30 years of serving vulnerable populations around the world. Chevron Cambodia Ltd., in partnership with the Asia Injury Prevention (AIP) Foundation, organized road safety awareness events at three different high schools in high-risk traffic locations in Phnom Penh to donate 1,500 helmets and educate the students about road safety. 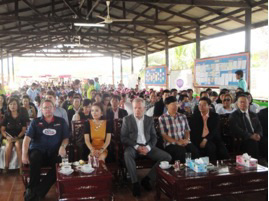 The first event took place at Hun Sen Borey 100 Khnang High School on June 29th, followed by a second one at Russey Keo High School on July 3rd and a third one at Chbar Ampeuo High School on July 6th. Guests attending the three events include Secretary General of National Road Safety Committee, Secretary General of Cambodia Red Cross, Director of Central Department of Public Order General Commissariat of National Police, Chevron representatives, and AIP Foundation representatives. The Cambodian National Road Safety Committee (NRSC) signed a memorandum of understanding with AIP Foundation to work together to reduce projected fatalities and serious injuries caused by road traffic crashes by the end of 2014. The partnership will support Decade of Action for Road Safety (2011-2020) objectives through the Cambodian Helmet Vaccine Initiative (CHVI), which aims to increase helmet use among motorcycle passengers and access to high-quality helmets. 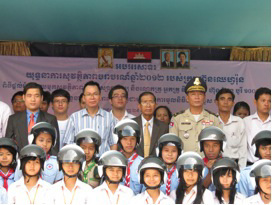 To maximize the impact of the Helmets for Kids program, San Dan I and Bun Rany Hun Sen Phom Thom Primary Schools in Kratie province and Prey Sandek Primary School in Takeo Province designed and implemented extracurricular activities for over 850 students during the first two weeks of July. U.S. Centers for Disease Control and Prevention and Go4 Intelligent Bunkering Solutions supported these events, including games, quizzes, trivia, and an essay-writing contest. Children were reengaged in correct helmet use, as well as pedestrian and bicyclist safety. In total, more than 30 teachers and AIP Foundation staff facilitated a Q&A session, practiced safe road behaviors, and played games with the students. On the last day, Prey Sandek organized a performance, inspiring excitement in the students, by their music club attended by about one hundred parents and representatives from the Office of Education, Youth, and Sport. 'Surprise fine' ban cheers drivers – The Metropolitan Police Bureau has ordered officers to stop setting up traffic police checkpoints at blind spots and encourages officers to give out warning tickets instead of fining traffic violators. This action has sparked debate between those who value fines for keeping Bangkok's roads safe and those who see excessive fines as part of a system of corruption. AIP Foundation and Department of Disaster Prevention and Mitigation (DDPM), Ministry of Interior, launched Thailand Helmet Vaccine Initiative (THVI) in Talad Kreab Municipality, Bangpa-in, Ayutthaya on July 4th with generous corporate and stakeholder support. The event kick started the implementation of the official collaboration between AIP Foundation and DDPM as part of the Thai government's 100% helmet use campaign. Honored guests included the Danish Ambassador H.E. Mikael H. Winther, Mr. Thomas Raldolf, of Pizza Company Racing Team, and Thai celebrities Cholrassami Nga-taweesuk from TV Channel 5 and Clare Patchimanon from TV Channel 3. The event demonstrated a firm commitment from multiple stakeholders to make roads in Thailand safer over the next 10 years, in accordance with the UN Decade of Action for Road Safety (2011-2020). Going forward, the Talad Kreab community model for road safety will serve as an inspiration for others throughout Thailand. Sigma Elevator donated 195 helmets to the students and teachers of Wat Nakprok Primary School in Bangkok on July 13th, as part of AIP Foundation's Helmets for Kids program. Wat Nakprok is located on a busy, narrow road, and yet many of the school's students frequently travel to and from school on the backs of their parents' motorcycles, their heads unprotected. Ratanawadee Winther, AIP Foundation's Thailand Country Director said, "These families may have limited road safety knowledge or resources, but thanks to this donation their children will be able to protect themselves." Sigma Elevator, a global brand, is the first elevator company to equip children and teachers in Thailand with the knowledge and tools to be safer on the road. In addition to the donation of 195 helmets, the school's teachers were trained in helmet use education, and extracurricular activities will be run throughout the year to keep the students engaged and aware. Guangzhou launches road safety campaign – In response to a deadly explosion last week, Guangzhou's government will implement a month-long inspection campaign targeting buildings and lots adjacent to the city's expressway in hopes of preventing future accidents like this one caused by oil leaks. A baseline study by Sichuan University was completed this month. This research is part of the pedestrian safety project implemented by AIP Foundation and Chevron Ltd. The findings will inform road safety curriculum development for grades one to six. 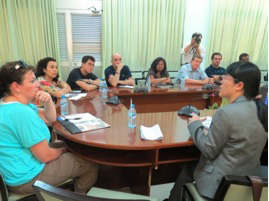 A group of advisors has been formed from the local educational department, police, and schools and consulted on the structure of the curriculum. The curriculum will be ready for pilot testing at two schools in Kai County in October 2012.